Shipping a flat rate priority mail package interisland. 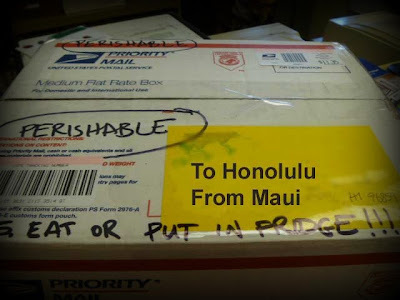 I took a picture of this package to remind me to pay attention to how I mail packages priority mail interisland or to the mainland. The US Post Office has flat rate priority mail shipping boxes that come in at least three sizes and two shapes. This particular day, I shipped two loaves of avocado bread to Oahu in a flat rate priority mail box and it cost $11 or so, and it would have been only $5 to ship it priority mail in a plain box. Sometimes it's better to ship a package priority mail using a flat rate box if the items weigh a lot, especially to the mainland. But other times, it's better to ship a package priority mail using a plain cardboard box, especially if it's interisland and doesn't weigh that much. I frequently forget and just use the post office packaging. It's not very pake (local lingo for cheap). Being pake is a useful life skill in Hawaii because things cost so darn much.